Students, residents, fellows, faculty and alumni were welcomed into the Alpha Omega Alpha medical honor society at a ceremony yesterday. AOA acknowledges scholarly achievement and qualities such as leadership, professionalism and community service. The newest members of the Alpha Omega Alpha (AOA) medical honor society were inducted at a ceremony on Tuesday, March 18. 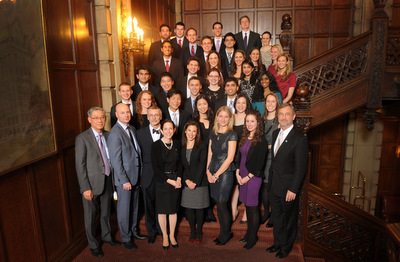 Inductees included medical students, residents, fellows, faculty members and alumni. AOA acknowledges scholarly achievement and qualities such as leadership, professionalism and community service. AOA speaker Daniel W. Foster, MD, John Denis McGarry, PhD, Distinguished Chair in Diabetes and Metabolic Research in Internal Medicine from the University of Texas Southwestern Medical School at Dallas, kicked off the evening with the Walter G. Barr, MD, Lecture. His presentation focused on science in medicine, the history of medical science and the future of academic medicine. The induction ceremony followed the lecture. 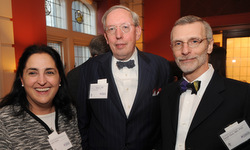 John P. Flaherty, MD, councilor of the AOA Illinois Gamma Chapter and professor in Medicine-Infectious Diseases, congratulated inductees and welcomed family and faculty members. A total of 27 medical students were welcomed into the society by John X. Thomas Jr., PhD, senior associate dean for Medical Education and Sandra M. Sanguino, MD, associate dean for Student Programs and Career Development. Other medical students inducted included Laura Banks, Chris Childers, Jonathan Chou, Dara Cohn, Clarabelle DeVries, Brian Dubin, Becky Farmer, Mary Alexandria Friedman, David William Grant, Alyssa Greiman, Shauna Himashi Gunaratne, Kassandra Holzem, Natalie Anne Homer, Daniel Hunter Katz, Vanessa Kiepura, Sarah Yuri Lee, Caitlin MacGregor, Bryce Merritt, Shayan Nabavi Nouri, Satvik Ramakrishna, Jasmine Rassiwala, Michael Rehorn, Nilay Shah, Vidit Sharma, Alexander Yowei Sheu and Anaar Siletz. Residents and faculty members were announced by Diane Wayne, MD, vice dean for Education. They were honored for ongoing leadership in their field and active participation in teaching and community service. Guests mingled at a cocktail reception before the induction ceremony. Left to right: Zena Leah Harris, MD, associate professor in Pediatrics-Critical Care, Eric G. Neilson, MD, vice president for Medical Affairs and Lewis Landsberg Dean, and David R. Gius, MD, PhD, Zell Family Scholar and Professor in Microbiology and Radiation Oncology. Residents and fellow inductees included Emma L. Barber, MD, administrative chief resident in Obstetrics and Gynecology, Laura Davidson, MD, resident in Medicine-Internal Medicine, Benjamin Korman, MD, fellow in Medicine-Rheumatology, and Sean B. Smith, MD, chief fellow of Medicine-Pulmonary and Critical Care Medicine. Faculty members welcomed into the society included Honorio T. Benzon, MD, professor in Anesthesiology, David R. Gius, MD, PhD, Zell Family Scholar and Professor in Microbiology and Radiation Oncology, Jacqueline S. Jeruss, MD, PhD, associate professor in Surgery, and John E. Pandolfino, MD, MS, chief of Medicine-Gastroenterology and Hepatology. Andrew D. Bunta, past president of the Medical Alumni Association, announced alumni inductees James P. Kelly, MD’83, MA, director of the National Intrepid Center of Excellence at Walter Reed National Military Medical Center, Boris Lushniak, MD’83, MPH, RADM, acting U.S. Surgeon General, and Quentin Young, MD’48, National Coordinator of Physicians for a National Health Program and chairman and co-founder of Health and Medicine Policy Research Group.